Congratulations to former group member Penghui Cao, who started a tenure-track Assistant Professor position in the Department of Mechanical and Aerospace Engineering at UC-Irvine in January 2019! Congratulations to Dr. Saman Seifi, who successfully defended his Ph.D. dissertation on May 18, 2018! Dr. Seifi's dissertation title was "Computational Modeling of Electro-Elasto-Capillary Phenomena in Dielectric Elastomers." Congratulations to Dr. Weiwei Tao, who successfully defended her Ph.D. dissertation on May 7, 2018! Dr. Tao's dissertation title was "Assessing the Mechanical Behavior of Proteins and Metal Nanowires using Long Timescale Atomistic Simulations." Congratulations to Dr. Xue Ben, who successfully defended her Ph.D. dissertation on April 10, 2015! Dr. Ben's dissertation title was "Opto-Mechanical Coupling Effects on Metallic Nanostructures." Congratulations to Dr. Zenan Qi, who successfully defended his Ph.D. dissertation on April 1, 2015! Dr. Qi's dissertation title was "Strain Engineering of Graphene." Congratulations to Dr. Penghui Cao, who successfully defended his Ph.D. dissertation on August 28, 2014! Dr. Cao's dissertation title was "Atomistic Simulation of Amorphous Solids and Proteins at Long Time Scales." Congratulations to Dr. Shuangxing Dai, who successfully defended his Ph.D. dissertation on December 11, 2012! Dr. Dai's dissertation was entitled "Atomistic study of Surface Effects on the Electromechanical Behavior of ZnO Nanostructures." Dr. Park was named Assistant Editor of the journal Computational Mechanics for the 2012-2015 period. Congratulations to Dr. Geng Yun, who successfully defended his Ph.D. dissertation on April 9, 2010! Dr. Yun's dissertation title was "Multiscale Analysis of Surface Dominated Nanomaterials." Congratulations to Dr. Changjiang Ji, who successfully defended his Ph.D. dissertation on July 2, 2007! Dr. Ji's dissertation title was "Surface Effects on the Mechanical Properties of FCC Metal Nanowires." W.K. Liu, E.G. Karpov and H.S. Park. 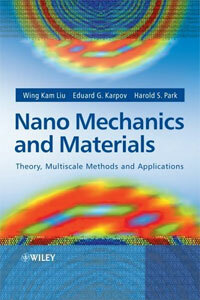 Nano Mechanics and Materials: Theory, Multiscale Methods and Applications, John Wiley and Sons, ISBN:0-470-01851-8, 2006.